Dissenting Words is a lively and engaging collection of interviews that span the length of Jacques Rancière's trajectory, from the critique of Althusserian Marxism and the work on proletarian thinking in the nineteenth century to the more recent reflections on politics and aesthetics. Across these pages, Rancière discusses the figures, concepts and arguments he has introduced to the theoretical landscape over the past forty years, the themes and concerns that have animated his thinking, the positions he has defended and the wide range of objects and discourses that have attracted his attention and through which his thought has unfolded: history, pedagogy, literature, art, cinema. But more than reflecting on the continuities, turns, ruptures and deviations in his thought, Rancière recasts his work in a different discursive register. 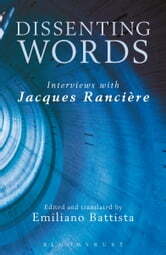 And the pleasure we experience in reading these interviews – with their asides, displacements and reconstructions – stems from the way Rancière transforms the voice of the thinker commenting on his texts and elucidating his concepts into another, and equally rich, manifestation of his thought.